Automatic, opt-out credit limit increases at Suncoast Credit union have helped drive sharp credit card growth. Advanced modeling techniques allays the credit union’s concern about ability-to-repay compliance. The Credit CARD Act of 2009 raised the bar for ensuring members have the ability to repay their obligations. Today, one Florida credit union employs sophisticated analytics to proactively raise members’ credit card limits and remain in compliance with the federal regulation. “We waited until we were comfortable with our ability to evaluate a members’ ability to repay,” says Lisa Johnson, vice president of loan administration and compliance at Suncoast Credit Union ($9.3B, Tampa, FL). Suncoast’s credit card growth rate soared after it began using analytics to target members with offers in mid-2017. The credit union conducted its first automatic increase campaign in mid-2017 in partnership with Experian. Modeling provided by the credit reporting company assessed a member’s propensity for spend and utilization as well as debt-to-income and other underwriting criteria. Armed with this data, Suncoast provided credit line increases totaling approximately $99 million to about 48,000 accounts. Using a slightly different methodology, the credit union partnered with Trellance to conduct a second campaign just before the holidays and provided credit line increases totaling approximately $65 million to about 28,000 accounts. The Florida cooperative is planning a third campaign this month. Like the other two, it will use email and the credit union’s home banking messaging system to inform members they’ve received a credit limit increase ranging from $500 to $2,500. And if a member doesn’t want that, they can opt out. Targeting certain members for credit limit hikes and balance transfer offers has helped Suncoast grow its credit card loan portfolio. The effect has been dramatic. 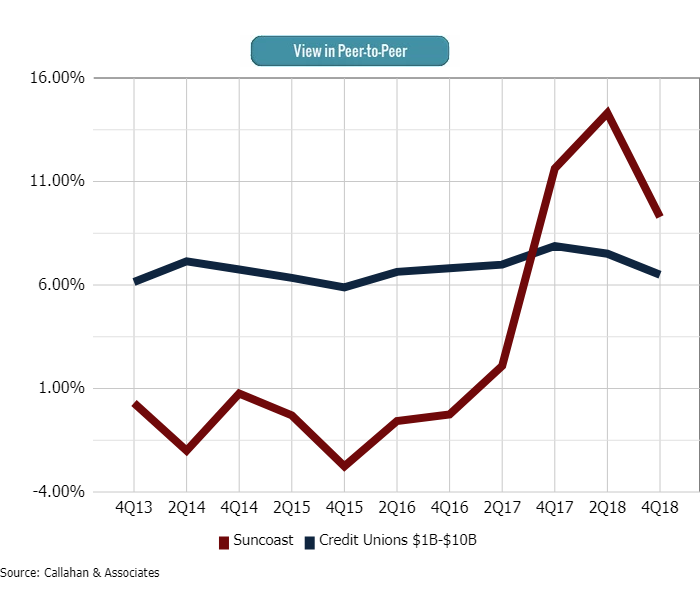 Suncoast’s credit card portfolio has risen 20.7% in 18 months, from $564.6 million in the second quarter of 2017 to $681.2 million in the fourth quarter of 2018. Its credit card growth rate, which had lagged its asset-based peer group, soared from 2.09% year-over-year in the second quarter of 2017 to 14.31% in the second quarter of 2018, cooling only slightly to 9.28% at year-end. That’s still well ahead of its peer group of credit unions with $1 billion to $10 billion in assets, according to data from Callahan & Associates. Meanwhile, the average credit card loan balance at year-end was $3,445. That has remained steady for past several years and is sharply higher than the $2,665 average for Suncoast’s asset-based peer group. Manually tracking your credit card ratios can be time-consuming, but with Callahan Analytics, it only takes a few minutes to see how you compare against your peers. Stay ahead of the trends. Members have the option to opt out of the credit line increase by contacting the contact center, but few do, Johnson says. “That tells us that many of our members were wanting a higher credit limit but maybe didn’t know they could ask for it,” the VP adds. 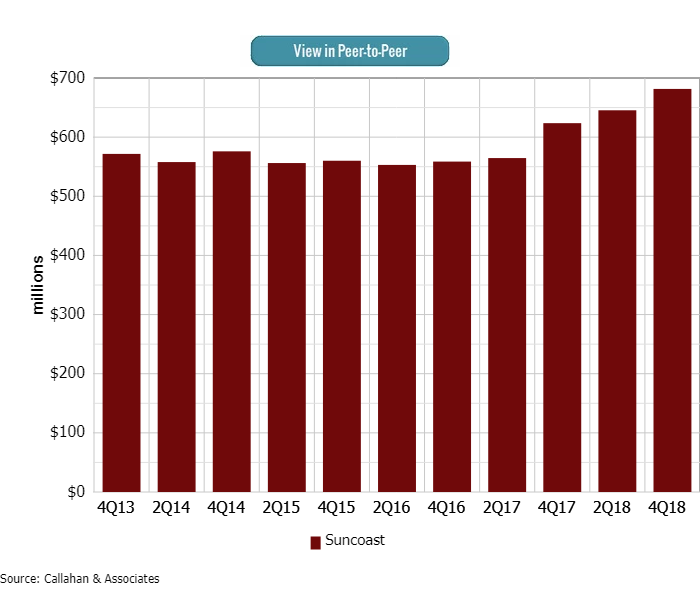 And although delinquency has also risen — from a low of 0.49% in the fourth quarter of 2017 to 0.93% one year later — that uptick reflects industry trends and remains below Suncoast’s peer group rate of 1.07% and the industry average of 1.35%. Suncoast is also using its in-house member intelligence expertise to identify and reach out to members with cards from other issuers. The most recent balance transfer campaign lasted approximately six weeks. It ended in mid-March this year after capturing $51 million, Johnson says. She attributes the success of these credit campaigns to a mix of the right messaging and the offers themselves. In this case of the balance transfers, the credit union knew whether a member already had a Suncoast credit card account and offered 5.9% for the life of the transferred balance plus as low as 8.9% on new purchases. “These are not teaser offers,” Johnson says. Alexa, How Does Numerica Do Payments?